Additional metal shelf for use in a SNOL 20/300 LFN Oven. Additional metal shelf for use in a SNOL 60/300 LFN Oven. An additional Metal tray for use within a SNOL3/1100 Muffle Furnace. Consumable fabricated tray to stop spillage manufactured from 310 stainless steel with a maximum temperature of 1100°C. Note that these trays are liable to thermal distortion and degredation under the maximum temperature. Lower heating rates and temperatures will result in less distortion. An additional Metal tray for use within a SNOL 8/1100 Muffle Furnace. Consumable fabricated tray to stop spillage manufactured from 310 stainless steel with a maximum temperature of 1100°C. An additional Metal tray for use within a SNOL13/1100 Muffle Furnace. Consumable fabricated tray to stop spillage manufactured from 310 stainless steel with a maximum temperature of 1100°C. An additional Metal tray for use within a SNOL22/1100 Muffle Furnace. Consumable fabricated tray to stop spillage manufactured from 310 stainless steel with a maximum temperature of 1100°C. An additional Metal tray for use within a SNOL39/1100 Muffle Furnace. 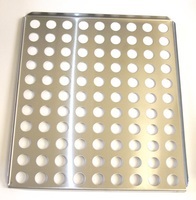 Consumable fabricated tray to stop spillage manufactured from 310 stainless steel with a maximum temperature of 1100°C. 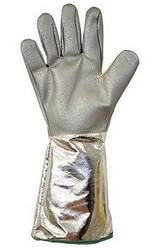 Polyco heat resistant furnace gloves. Suitable for temperatures up to 500°C for up to 27 seconds. Conform to EN Safety standards giving protection from thermal hazards (BSEN388:2003) and mechanical risks (BSEN407:2004). Ansell heat and cut resistant gloves. Suitable for temperatures up to 350°C for up to 15 seconds. 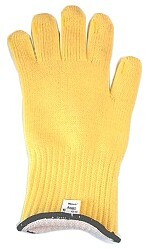 Seamless knitted gloves coated with kevlar. 100% cotton inner lining. Machine washable up to 40°C. 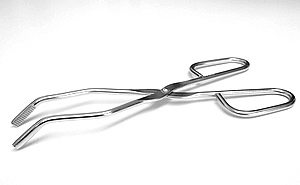 Grade 18/10 Stainless Steel furnace tongs by Bochem. 200mm long with grooved tips ideal for safely handling and moving metal and ceramic crucibles from furnaces. These tongs are anti-magnetic and corrosion resistant. Suitable for use in autoclaves.